Think you may be experiencing issues with your bathroom plumbing? Lookout for these warning signs. No matter the time of year, your bathroom plumbing gets a lot of use every day. Draining sinks and tubs, running the faucet, and flushing the toilet all put strain on your bathroom plumbing. Damage to plumbing can cause all sorts of problems that you will definitely want to avoid as a homeowner. 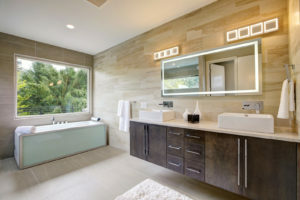 Sometimes, you can’t help that things need to be repaired, however there are a few signs that you can look for that can alert you whether your bathroom plumbing is having problems or not. Keep reading for some tips and tricks you can use to catch bathroom plumbing problems before they become unmanageable. Pay special attention to your drains and pipes when it comes to your bathroom plumbing. If something is wrong in there, then you can probably count on the fact that there is something going on with your drains or pipes. If your drain is sluggish, then you probably have a clog that you definitely will need to take care of. Most home improvement or hardware stores carry drain-opening products. This way you can take care of the problem itself! If you do not want to use chemicals, then you could also try a plumbing snake or even pouring some hot water down your drain. If these options do not work, then it is time to call a professional. If a serious clog is left untreated, a pipe can burst. Something could also be wrong with your pipes. If you hear a knocking sound while you are running water or if you turn the tap on and off, then pressure changes may have caused your pipes to shift and break from their brackets. If you notice any of these clues, then you should call a professional plumber right away. If you have a dripping faucet there may be a problem even if the drip is very slow. A dripping faucet could signal a lot of problems, big or small. A washer could need replacing or something much more complicated could be going on. Give us a call and we will definitely be able to help. Changes in your water pressure could also signal problems, especially if you begin experiencing decreased water pressure. Leaking or broken pipes, water heater malfunction, or even a dirty shower head can be issues that may arise with you bathroom plumbing. Questions? Call B&D Plumbing Today! If you have any questions about your bathroom plumbing, the experts at B&D Plumbing are here to help you! We have been servicing the Washington DC metropolitan area including Maryland and Northern Virginia. Give us a call at 310-595-1141 to ask us any questions. Be sure to follow us on Facebook, Twitter, Google+, LinkedIn, and Pinterest for tips, tricks, and to see what we have been up to. This entry was posted on Friday, March 29th, 2019 at 2:39 pm. Both comments and pings are currently closed.